Peach season is winding down for most parts of the country, but I wanted to be sure to share this recipe for those that still have good peaches available. Here in Oklahoma we have had a great peach year. I went to the peach orchard three times this summer. We had a cooler summer than we have had the last few years and it made for great peaches. They were so good. We ate basically all of them fresh because that is our favorite way to eat them. I did manage to make a few things with them like this baked oatmeal though that we loved. I can still find some pretty good peaches in the stores here, so I am guessing this oatmeal will be on the plan a few more times over the next couple of weeks. 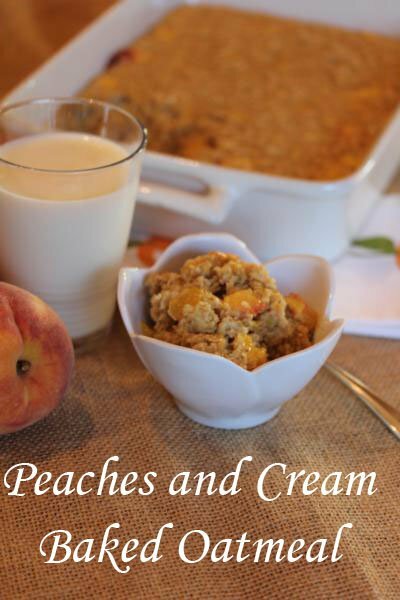 This peaches and cream oatmeal is very similar to my strawberries and cream baked oatmeal. It is like a grown up or gourmet version of those little oatmeal packets. So good! And if you are looking for more baked oatmeal ideas be sure to check out my other baked oatmeal recipes. 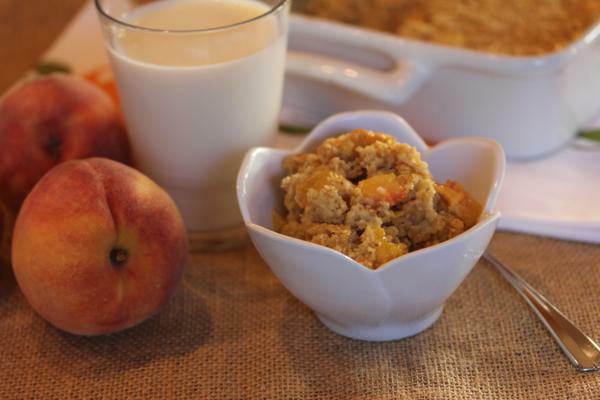 In a bowl mix together all ingredients, except peaches and combine well. Carefully stir in the peaches. Serve warm drizzled with additional milk or cream if desired. Note: You can use all milk instead of the cream, but the cream really does make it creamier and richer tasting. I absolutely love your baked oatmeal recipes. My kiddos do too! I started making when we had an abundance of strawberries when we went strawberry picking. They begged me to make it everyday. I can’t wait to make this one. I also haven’t tried the peanut butter recipe but hope to in the very near future! This is so filling and healthy. Thanks for sharing. PS. I think I mentioned before that I never have heavy cream on hand so I just use what I have almond or skim. Always good! I just made this and it was great! I only had skim milk in the house and I think it still tasted very good! My 7 month old daughter ate 2 servings! I’m going to try more of your baked oatmeal recipes. Thanks! Yes I would reduce the liquid, by some. I think honey might work better in this than maple syrup as it is not quite as thin. I think you could easily make it work, but adjusting the liquid. I have used honey in many things, but not baked oatmeal, but now I am going to try it. I love the idea! So thanks for asking. So here’s what I did, and it turned out great! I did not have cream, only skim milk. So I used 2 and 1/4 cup of skim milk instead of the 2 and 3/4 (milk plus cream) the original calls for. So reduced the liquid by 1/2 cup. I added an extra egg for a total of 3 for a bit more binding agent. Voila. It is delicious with these yummy peaches we’re having this year! I am substituting the heavy cream with greek yogurt, and have added a bit of cinnamon. Can’t wait to taste it in the morning! I hope you enjoy it. I have made other baked oatmeal with yogurt so I think it will work fine. I have quite a few baked oatmeal recipes. I am guessing it is one of these. Let me know because if it isn’t I will try to figure out what one that you mean. Do you think frozen peaches would be ok in here? I have not tried it, but yes I think they would work fine. I only buy whole oats. Could I use them in place of the quick cooking oats? By whole oats I think you mean old fashioned oats. 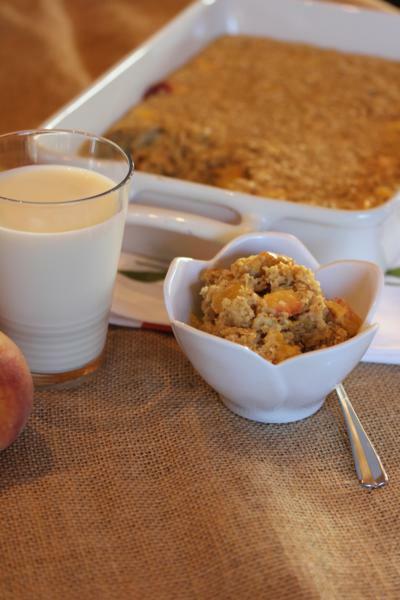 Yes, old fashioned oats work in all my baked oatmeal recipes. The texture is slightly different, but they work fine. I hope you enjoy it! Can you use old fashioned oats instead? If so do you do anything different? Yes, you can use regular old fashioned oats. The texture is slightly different, but it works fine.